Contributing editor Mark Bourrie takes a look at casualties of the War of 1812 — and the budget planned to commemorate its bicentennial — and decides to take a pass on dressing up history. 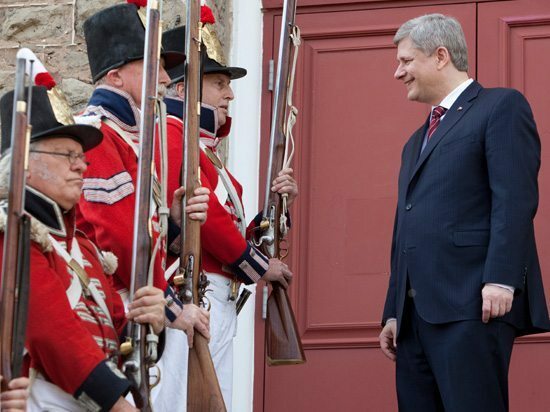 Expect plenty of dress up days and photo ops as the Harper government gears up to spend 11.5 million on commemorating the War of 1812. Photo courtesy www.1812.gc.ca. If you work for the federal government and you’re worried that you’re about to be program-reviewed onto pogey, I hope you draw some comfort from the Harper regime’s plan to spend $11.5 million on commemorating the War of 1812. The money will be carefully spent and counted for, no doubt. Silly, fat middle-aged high school teachers dressed as War of 1812 soldiers will re-enact some of the battles, which should be great fun. There’s nothing more fun than watching grapeshot tear through a line of well-disciplined soldiers. Who will play the role of Robert Barclay, the British commander at the Battle of Lake Erie, who went into the fight with one arm and came out with none? “The compound fractures of the extremities were much retarded in their cure, by the frequent displacement of the bones, by the motion of the ship in rough weather, or by some other unlucky disturbance of the limb. In this way the bones in one case did not unite, until after forty days had elapsed, and in two or three other cases, not till after twenty-five days. And he was looking at the wounded on the winning side. I say it’s well-worth $11.5 million to re-enact this with anyone who wants to volunteer. There’s nothing like a little well-directed cannon fire to bring Canadians and Americans together and show the kids the reality of war. But to suggest that the war of 1812 is somehow “Canada’s War of Independence” and that, as the Globe and Mail said Tuesday Canada was “forged in blood” is to play very fast and loose with the truth. None of the people who fought the war, except for the French-speaking militiamen who fought with Charles de Salaberry outside Montreal, and the Native people who mainly supported George III’s side, thought of themselves as anything but British. As for the saving of “Canada,” the entire land war took place between Lake Champlain and Sault Ste. Marie, except for the seizure of an American fur trade post on the west coast. There’s a good reason why the war is barely remembered outside the Great Lakes basin. The “battles” were, even by the measure of the times, mere skirmishes. The “campaigns” were little more than raids. Even when the Americans took some ground, they quickly went back across the border. There was no serious attempt to conquer and occupy Canada. Here’s a little perspective: 19,000 soldiers died at the Battle of Ligny, part of the maneuvers leading up to the Battle of Waterloo in 1815. About 3,900 soldiers and sailors were killed in the entire War of 1812; about twenty-five people died on both sides at the very important Battle of Chateauguay in October of 1813. But this waste of money is not about history. It’s about propaganda, parades, playing dress-up, and pretending we fought for our independence when, in fact, we earned it by developing solid democratic political institutions, including a free press. So, unless they’re using live ammunition at the re-enactment of the Battle of Lake Erie or at Lundy’s Lane, count me out. I won’t collect the commemorative coins or listen to the fatuous speeches. I’ll be busy bracing myself for the waves of nonsense we’ll soon be hearing about the First World War, as we head towards its centennial in 2014.